Talyia is an Asian Faerie. She is made of Polymer Clay and is about 3-1/2 inches seated. 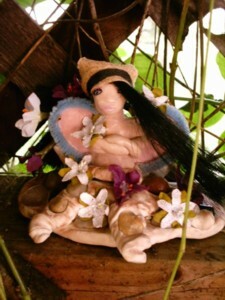 She has black synthetic hair and her blue eyes are made of beautiful beads embedded right into the clay. Her pink wings are made of clay. Talyia has her arms folded and is making a pouty face. She is # 1 in the Asian Faeries Series.